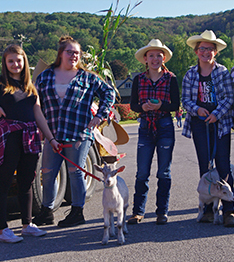 Located in the Borough of Ridgway in scenic northwestern Pennsylvania, our school district is part of a supportive and close-knit community. We’re situated in a valley intersected by the Clarion River and surrounded by state and national forest land. Explore some of the wonderful things our city has to offer, and see what makes our community unique—and a wonderful place to live! Check out some of the fun activities our area has to offer. Elk County Historical Society: The historical society is a collection of artifacts that are important to Ridgway and Elk County. The Victorian-era house consists of authentic furnishings, a genealogy research room, and a chapel. Enchanted Woodlins: These five chainsaw carvings are located throughout Ridgway. Visit the Chamber of Commerce for a map. Be sure to check out the Chainsaw Carvers Rendezvous, where carvers create masterpieces out of logs throughout the week. Ridgway “Lily of the Valley” National Historic Register District: Take a tour of history, where you’ll find over 700 homes, businesses, and other historic buildings—some built as far back as 1855. Outdoor Recreation: Elk County is considered the southern gateway of the Allegheny National Forest. It’s home to a wonderland of wildlife, trails, and family-friendly canoeing.